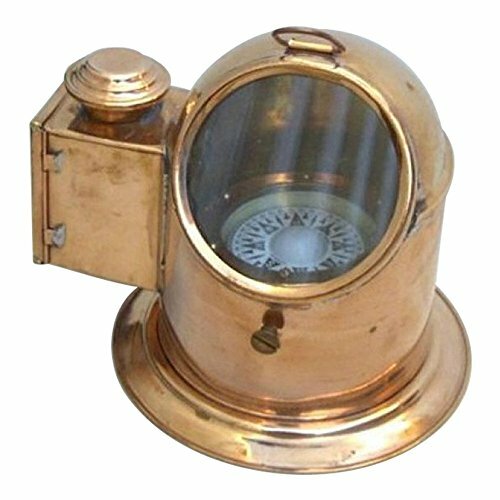 This authentic Binnacle compass incorporates an oil lamp for easy visibility in those dark nights at sea. The copper and brass construction is sturdy and beautiful. This will form a great addition to your nautical dŽcor. Measurements: 7"
Highest Quality: Our outdoor items are made from the finest metals, and the best in class wood! Perfection: Designed to be perfect for outdoors and camping, or even to be seen on display in your home as a unique conversation piece! Nautical: This piece is designed for the sailor in you, with it's nautical and antique charm! Satisfaction Guaranteed: We promise that all of products are of the highest standard, so we always guarantee 100% satisfaction!